The January 23rd working party totalled eleven members of the team at work on 82045. Quite often a smaller number put in a second day mid week. The footplating work has moved around to the right hand (fireman's) side of the loco and the mid section piece in front of the smokebox. Although to the casual observer these sections of footplating may just look like bits of tin they are surprisingly heavy and involve a lot of work in achieving the correct shape and fit. Work continues on welding manganese plates to the backing plates for the horn block and horn guide liners and the associated machining. We still have to make all the bolts to attach the liners to the horns. 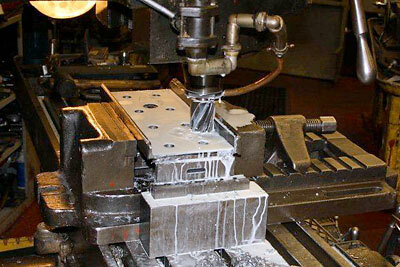 The production of cold rivets is underway for the test area of cold riveting which will be attaching the liner plates to the four main lifting holes for the chassis. The right hand side motion plate is now on site following machining and we hope that the same component for the left hand side will soon be cast and machined. There are still a small number of 2012 calendars available (details on the December update). Please email Barbara to reserve a copy before sending any monies. Thank you. Many thanks to all of you who are supporting the wheel fund so generously: the response to the appeal so far has been excellent, and at the time of writing the ring-fenced bank balance stands at over £15,000. Please try to persuade as many of your friends as possible to join us at this most crucial phase of the project. Once the chassis has been wheeled, we can then go all out for the last big piece of the kit that is rapidly becoming a new BR Standard Class 3 tank, namely the boiler and firebox. In regard to the latter, don't forget that we already have the most costly component - the copper - if only in cyberspace at the moment, where at least we don't have to worry about its security. We hope to be able to begin the wheeling process within the next twelve months, so look out for a splash of publicity in the hobby press this coming spring, and the appearance of a new Wheel Appeal leaflet, aimed specifically at the wider membership of the SVR. At the current rate of progress, it is not unreasonable to hope that 82045 will be up and running in five years. It would be wonderful if the locomotive could be launched into service in July 2017 - fifty years since the last two working examples of the class (82019 and 82029) were withdrawn - commemorating the last epic run of 82029, commandeered on its very last day in service to work the Salisbury parcels from Waterloo as far as Basingstoke. Of course, all this is dependent upon the continuing support of all our friends, and I can rely on my pragmatic colleagues to keep me firmly in the realms of reality. In this connection, it is worth noting that, on Monday 23rd January, there were no less than 11 people hard at work on the loco at Bridgnorth, and two more in Cheshire working away in the background. The add-on economic benefits of so much dedicated volunteer input cannot be overstated. Martin, Rod, Brian and Bryan offer up a section of the right hand side footplating. 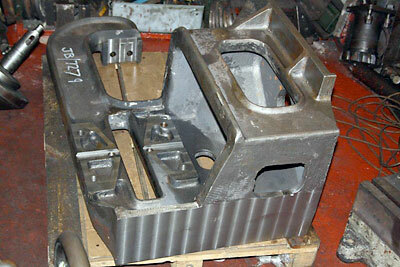 A manganese liner plate on the milling machine under the care of Richard. 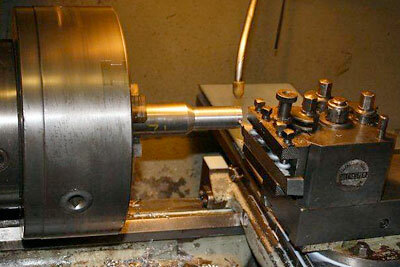 A cold rivet being produced on the lathe by David. The right hand side motion plate.